FilmJuice Competition: To celebrate the release of A Walk In The Woods we've got TWO copies of the DVD and the Book to Give Away! For your chance to win, simply answer this question (entry details at the bottom of page): Which Hollywood icon stars in A Walk In The Woods? 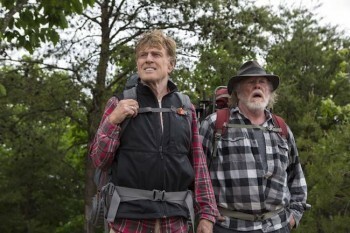 Based on the international best seller by Bill Bryson, A WALK IN THE WOODS is a heart-warming adventure that sees two long lost friends reunite on an intrepid trek across 2,180 miles of America’s most rugged, yet beautiful countryside. Upon his arrival back in the United States following two decades in the UK, Bryson (Academy Award-winner Robert Redford) wants to find a way to reconnect with his homeland. Impulsively he decides to hike a section of The Appalachian Trail; the longest continuous footpath in the world which stretches from Maine to Georgia, and an expedition men half his age struggle to complete. Fearing for his life, his wife Cathy (Academy Award winner Emma Thompson) refuses to allow him to do a solo trek but is unsuccessful in persuading any of his friends to accompany him. When his old buddy Katz (Academy Award nominee Nick Nolte), a crude, overweight, recovering alcoholic, calls him out of the blue and offers to accompany him Bryson gets more than he bargained for. Join Bill and Katz as they encounter wonderful and wacky characters and face the highs and lows that both the trail, and middle age, have to offer. 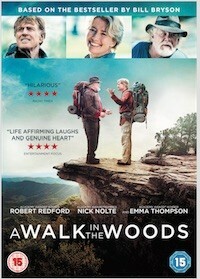 A WALK IN THE WOODS is available on DVD from 22nd February just in time for Mother’s Day.